Let's face it, we spend an average of 4 hours per day on our smartphones, carrying it around everywhere we go. With the advancement of technology, smartphones are already replacing our professional cameras but one things still missing - exceptional zoom. Wolf Tamir camera lens kit bridges that gap, transforming your smart phone into an epic image taking masterpiece in seconds. Sharp and Compact, WOLF TAMIR 18X Telephoto Lens Camera Offers the Ultimate Smartphone Photography Experience. Capture the tiniest details in high definition within 3 miles of anywhere you're standing with our 18X zoom capacity lens. Imagine how bringing distant subjects closer elevates your selfies, portraits, large group photos, architectural shots, and cityscapes. ● Adjust the clip's lens opening to include the camera and the light port. The clip is extended by pulling the both side edges. ● Make sure it fits smoothly, otherwise a dark ring around the image will show.It doesn't fit with dual lenses phones, such iPhone7 Plus, 8 Plus, X. ●Fix to the tripod and enjoy your upgraded phone camera lens! ● Can be used with any cellphone with a width of 2-3,5 inches.Easy to mount iphone camera lens. ● Focus ring included to manually adjust the image clarity and focus as per your needs. ● Bonus tripod stand to position your phone. 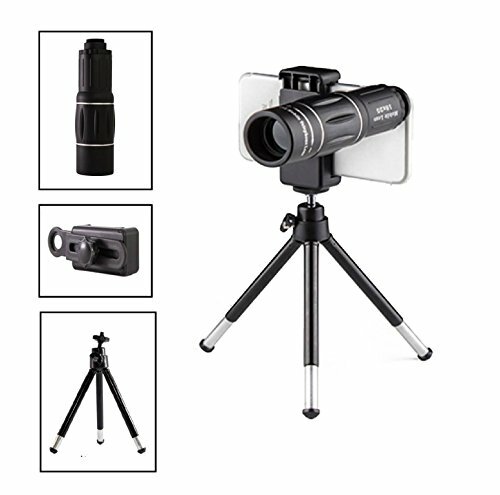 ● Heavy-duty components ensure long-term cell phone lens attachment. Join us in our mission to reinvent the way we capture images and videos from our smartphones! Questions? Suggestions? Need assistance? We're here to help you! COMPACT & LIGHTWEIGHT - IDEAL FOR TRAVELERS, NATURE LOVERS & JOURNALISTS: Unlike other bulky lenses, this one cell phone lens kit, easily tucks neatly into your pocket, day bag or luggage for easy carrying, and total adventure enhancement making it a PERFECT GIFT for anyone who loves to make memories as they go! COMPATIBILITY - WORKS WITH YOUR SMART PHONE: Zoom lens for smartphone easily attaches to 2-3,5 inches wide phones such as iPhone, Samsung or Huawei. It doesn't fit with dual lenses phones, such iPhone7/8 plus, X.MINI TRIPOD: Don't let shaky hands ruin your images - use the free bonus mini tripod-high quality, metal joints! MONEY BACK GUARANTEE - TRY FOR 30 DAYS RISK FREE: We stand by the quality of our mobile camera lens. You'll feel 100% satisfied with iPhone camera lens kit, and if for any reason you're not simply let us know within 30 days and we'll extend a prompt, full friendly refund - no questions asked! If you have any questions about this product by Wolf Tamir, contact us by completing and submitting the form below. If you are looking for a specif part number, please include it with your message.